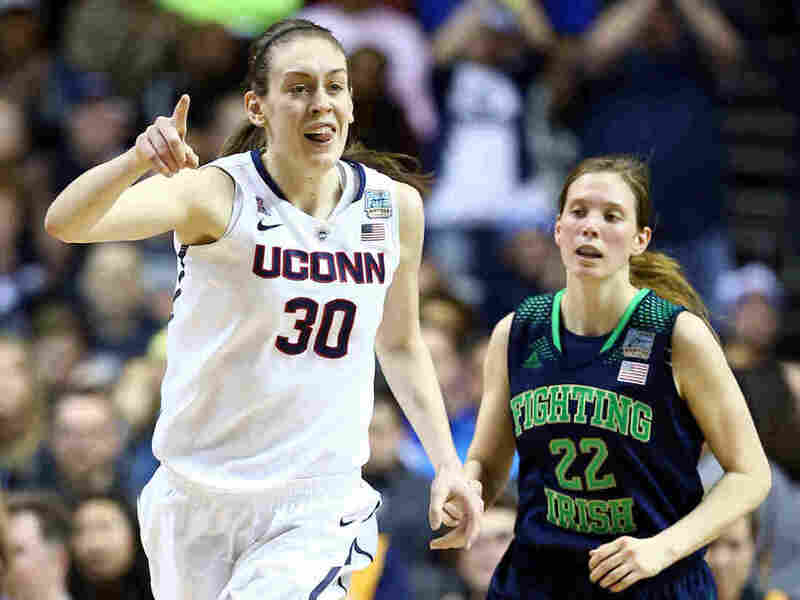 UConn Women Win, Making School Center Of College Hoops World : The Two-Way Both the men's and women's teams are Division I basketball champions this year. Only once before has a school done that in the same year: UConn, in 2004. They're No. 1: Breanna Stewart of the Connecticut Huskies reacts after a score during Tuesday night's game against Notre Dame. Her team won its ninth national championship. By routing Notre Dame 79-58 Tuesday night in Nashville, the University of Connecticut women's basketball team won its ninth NCAA championship — which means that coach Geno Auriemma is no longer tied with legendary Tennessee coach Pat Summitt for the most titles among women's coaches. Before Tuesday, only one school had won both the men's and women's Division I basketball titles in the same year. That would be the University of Connecticut, in 2004. Now UConn has pulled off that feat twice. The men beat Kentucky to win their tournament on Monday. "It's just such a big deal," said Alexander Potts, a sophomore from Norwich, who was in the stands for both the men's and women's games. "We love basketball here, it's our No. 1 sport, and nobody is better at it." "It was the fifth unbeaten season for Auriemma and UConn and the first time the Huskies went 40-0 — matching Baylor as the only schools to accomplish that feat. The victory was also Connecticut's 46th straight dating back to last season's NCAA tournament title run. It's the third longest streak in school history — well short of the NCAA record 90 straight they won. "The loss was Notre Dame's third in the title game in the past four years. Kayla McBride finished off her stellar career with 21 points to lead the Irish, who were looking for their first championship since 2001." One historical note: While UConn is the only Division I school to have won the women's and men's championships in the same year, that two-fer has been pulled off once in a lower division. USA Today's For the Win blog points out that "in 1984 the University of Central Missouri, then known as Central Missouri State, captured both the men's and women's Division II titles in the same year."